How can manufacturers of printing inks hold their own in their shrinking market? The rapid ascent of online printing plants has revolutionized the printing industry in recent years. “In more and more segments, digital printing is more efficient and faster than analogue printing processes”, says Oliver Kutsch, managing director of the market research institute Ceresana. 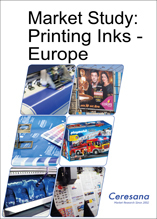 “Besides substitution effects between the particular printing processes, especially publication printing is exposed to a high competition with digital publishing processes.” Ceresana analyzed the European market for printing inks, which also includes toners for electrophotography (laser printing). The analysts expect the market for printing inks to decrease to a level of 1.17 million tonnes until 2024. Some segments, however, will experience growth. In various Eastern European countries, total demand for printing inks is expected to increase in the upcoming years. Publication printing also has to face the problems of decreasing print circulations, a lack of advertising budgets, and the migration to competing digital products. However, these losses will be more than compensated by a very dynamic packaging market. In Russia for instance, the demand for printing inks in the segment newspaper printing will most presumably decline by about 3.8 % per year, but the demand in the segment packaging printing will increase by 4.2 %. There is a trend towards smaller circulations, a higher number of printing orders and personalized contents in an ever shorter time which favors digital printing that enables enormous time savings due to a fast production, adaption, and transmission. Digital printing systems can fully demonstrate their strengths in the case of job printing of advertising inserts and other occasional printed materials. Digital printing is also gaining ground in letterpress, label printing, and other packaging applications, especially since steel, aluminum, and plastics can now also be printed on. The technological progress is constantly increasing the printing quality and speed, while the costs are declining: Digital printing is becoming competitive in more and more application areas. Investments in new inkjet systems are reaching new record levels across Europe. Packaging printing is gaining importance for manufacturers of printing inks: There is no digital replacement for packaging. The packaging effort even increases. The labeling obligations become stricter. Internet trade strengthens the mail order business and thus the demand for shipping packaging. These are very good conditions for further growth: For the upcoming eight years, analysts at Ceresana expect demand for packaging inks to increase at 2.0 % per year. Regulations regarding the migration of pollutants are an important aspect in food packaging. A growing health and environmental awareness is leading to the development of new printing inks and processing methods, for example the use of UV and other radiation-curing printing inks. Complete curing prevents photoinitiators from being released by low-migration UV inks. More and more effective barrier layers are being integrated in packaging to prevent the migration of printing inks. While the demand for conventional solventborne products is declining, the market for modern, inks low in harmful substances is developing dynamically. Chapter 1 analyzes demand, production, import, and export as well as revenues in regard to printing inks for 21 countries. Furthermore, the study analyzes the demand for printing inks in the individual application areas as well as split by printing processes. Chapter 2 offers a detailed analysis of various application areas of printing inks: Data on the development of demand in the application areas newspapers, books, magazines, advertising, packaging as well as other applications. Chapter 3 examines the demand for printing inks split by the printing processes offset, gravure, flexo, digital, and other printing processes. Chapter 4 provides useful profiles of important manufacturers of printing inks – clearly arranged according to contact details, turnover, profit, product range, production sites, and profile summary. In-depth profiles of 67 manufacturers are provided, including Agfa Graphics N.V., Altana AG, Colorgraf S.p.A., DRUCKFARBEN HELLAS S.A. Group, Flint Group SA, FUJIFILM Europe GmbH, hubergroup, Inx Europe Limited, Sicpa Holding SA, and Siegwerk Druckfarben AG & Co. KGaA.